It’s that time of year when Costco put their furniture on display again! I am constantly impressed by the quality, price, and style of the furniture that they put on display at my local Costco. 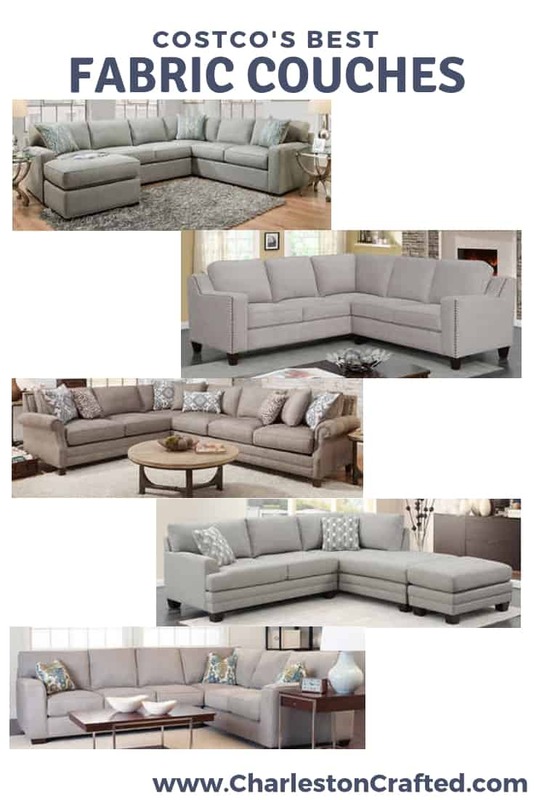 Today I wanted to round up my favorite Costco couches! There are lots of stores that sell couches, but Costco has some of the best deals on sofas, in my opinion. I love how Costco stands by their products and quality with easy returns. Online shopping for furniture can be nerve wracking, so shopping with a store you trust is key. A lot of the sofas at Costco are sectionals, but they also have sofa sets for sale! 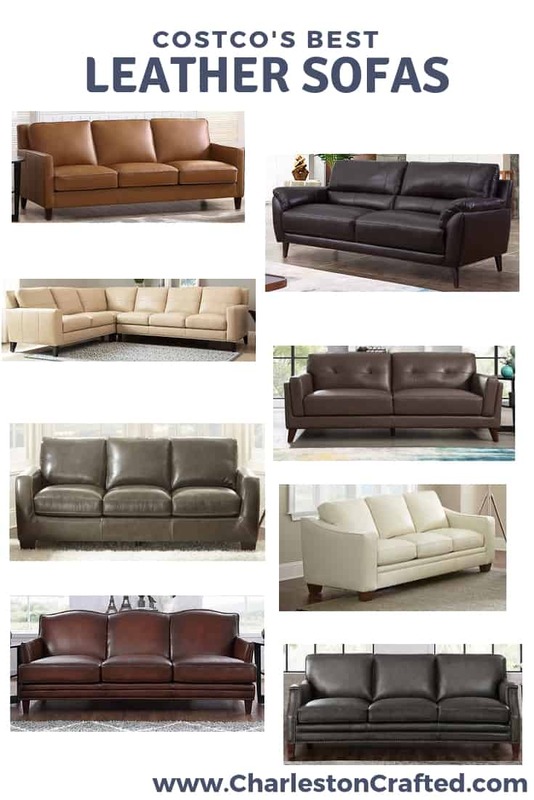 I found all of these furniture deals online at Costco.com. Click here to pin this to your pinterest board! This might be my favorite Coscto couch ever. I am obsessed with the clean lines. That modern shape pairs really well with the more traditional leather fabric and color. It is a really well balanced piece that could work with a variety of styles! The padded arms on this sofa make it look so comfortable. But, it still manages to look modern. This is pretty much the ideal brown leather sectional. It has nice lines and looks comfortable without that comfort being at the expense of style. The color is a really nice shade, too, that would pair well with a lot of wall colors. This is a great option if you are looking for a more dark chocolate brown leather couch. It has just enough tufts in the back to add interest without looking too stuffy or uncomfortable. This is the most traditional leather sofa that I picked. It has a bit less of a clean shape but still is not overstuffed in that classic 90’s way. It is a nice chocolate brown color leather and I love the use of seams to add interest to the corners. If you are looking for an ivory colored leather couch, this is a great bet. The arm shape is really stylish and makes the whole thing look more modern. I love the brown stain wooden legs for contrast to the ivory leather. If you are looking for a more formal leather couch, this one is a great buy. The wave in the line of the back really makes it look special. There is also brass nail head trim which always looks more formal. If you like the nailhead trim, you will love this couch. It has a ton of the brass trim that really pops off of the gray leather color. This is a beautiful gray L-shaped sectional with a chaise. It has a nice shape and a total of 6 seat cushions – so it is really big! It is simple but classic for a reason. This l-shaped couch has the addition of nailhead trim. The arms have a nice geometric shape to it, which makes it just a little different from the average couch. This sectional comes in 2 shades of gray. It can be set up as left facing or right facing. It has a traditional shape, a nice gray color, and really great reviews on Costco.com. I love the roll arms on this sectional. It looks a bit more formal because of that, while still being very comfortable. It also includes 8 throw pillows which is a lot for this kind of couch! This is a smaller sectional with a chaise and an ottoman. I love that it gives you more flexibility and might work for a smaller space.